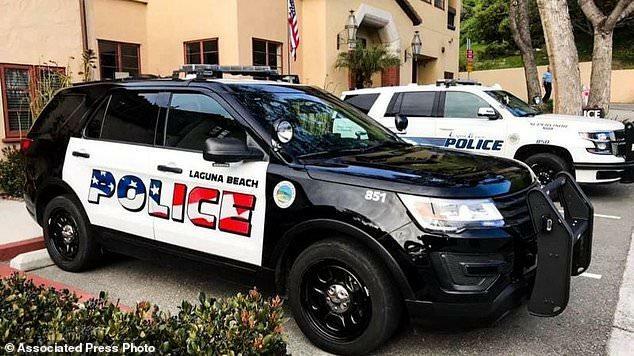 Progressives living in the wealthy Southern California enclave of Laguna Beach have become triggered by a recent decision to repaint the city's police cars with the American flag running through lettering on the doors, according to the LA Times. The design - approved in February - was deemed by some to be "unfit for the artists' community." The ensuing debate has pitted flag supporters against flag opponents, and should make for an interesting City Council meeting Tuesday evening. Officials say the matter is "far more nuanced," according to the Times. "Clearly, the way it looks on the car is not what anyone expected it to look like," said Dicterow. "I think it’s reasonable that we’re going to look at it again so that whatever we [approve] is exactly what we put on the car." "Some of the words people used was that they felt it was threatening, intimidating, harassing and a symbol of racism." Local artist Carrie Woodburn, whose parents served in the military, said at a recent council meeting that the design on the squad cars looked "aggressive." By Monday morning, Woodburn said she received over 150 messages via phone, text, voicemail and email who disagreed. "I don’t really care too much about the design, other than what I said — it's bad art," she said, adding: "I’m being attacked for that because the narrative feeds a fire of division, which is what our culture has become." California attorney Jennifer Welsh Zeiter says she finds the flag design "exceptional" and questions the loyalty of anyone who objects to it. "They are so filled with hatred toward this ... office of the president of the United States and the current occupant of that office," said Zeiter, adding: "that they cannot see through their current biases to realize that a police vehicle with the American flag is the ultimate American expression." According to City Manager John Pietig, the design originally approved in February was more of a "cloud-like look" vs. the design that now appears on the cars. Laguna Beach Republicans president Emil Monda said that he thought the whole debate over the flag is "bizarre." "It’s the flag of the United States of America," said Monda. "It’s not a Republican flag, it’s not a Democrat flag. It’s our flag, and we can’t lose that." "Every time I came to a stop sign, every time I came to a red light, somebody is telling me the car looks great," said Cpl. Ryan Hotchkiss during the March meeting. "Every one of our members that drives the car loves it, and we look forward to keeping them the way they are."